H407. 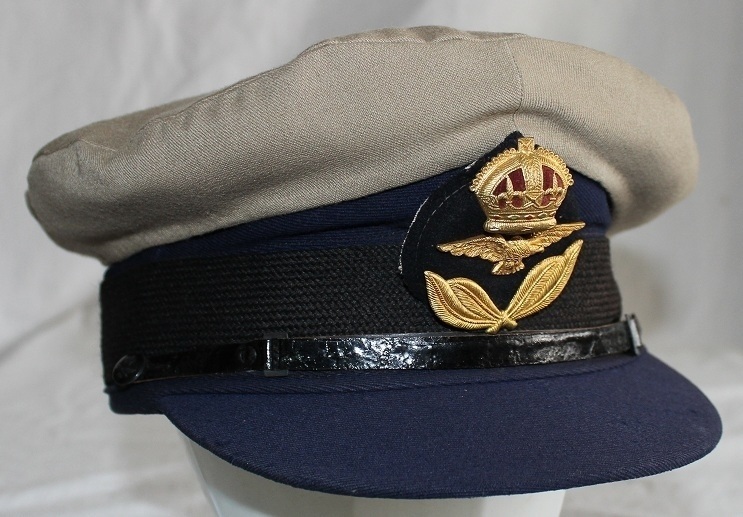 An unnamed officers service dress cap with a pressed gilt metal economy cap badge made by National Clothing Co (1939) Ltd 40 King St Perth WA. 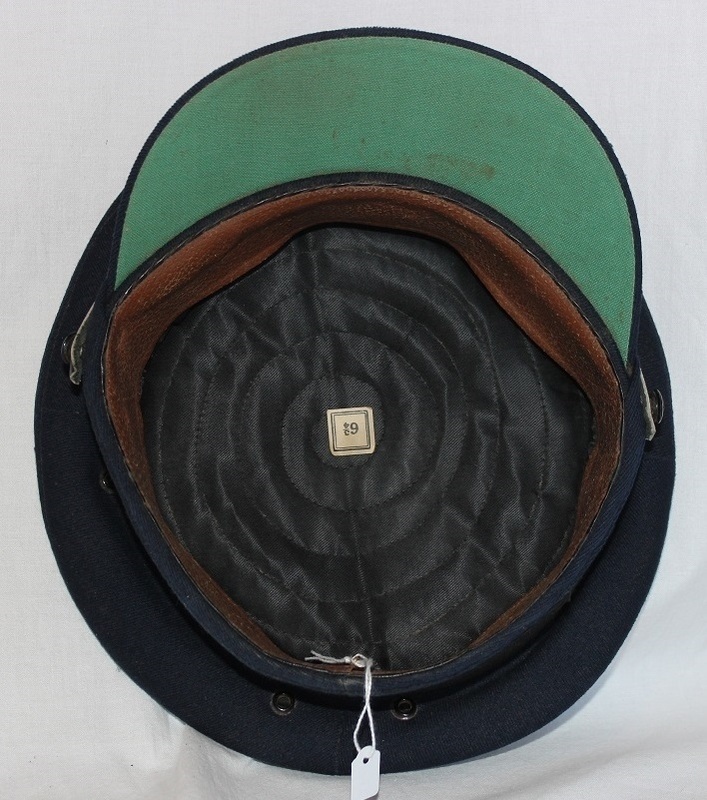 The cap is lined with a black material sewn in a diamond pattern and has a green underside to the peak. 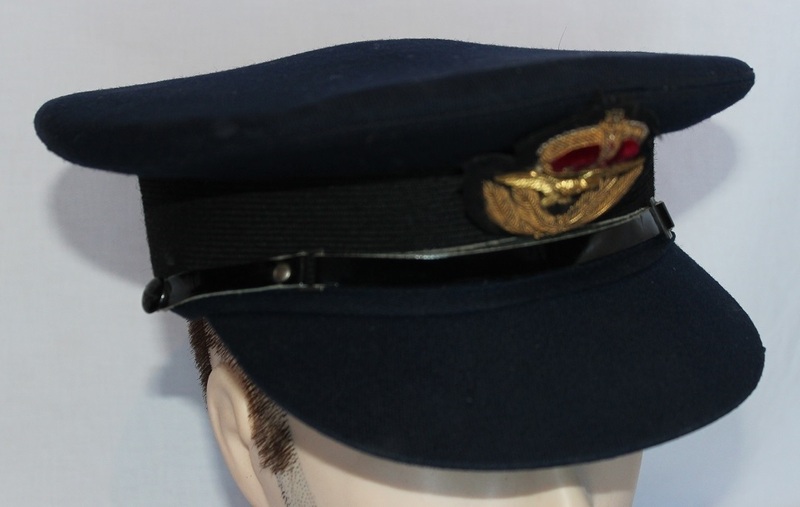 The sweatband is unmarked, the hat band is incorrect as is the chinstrap which is held in place by 2 plastic RAAF buttons. H407. Back of cap badge. H415. 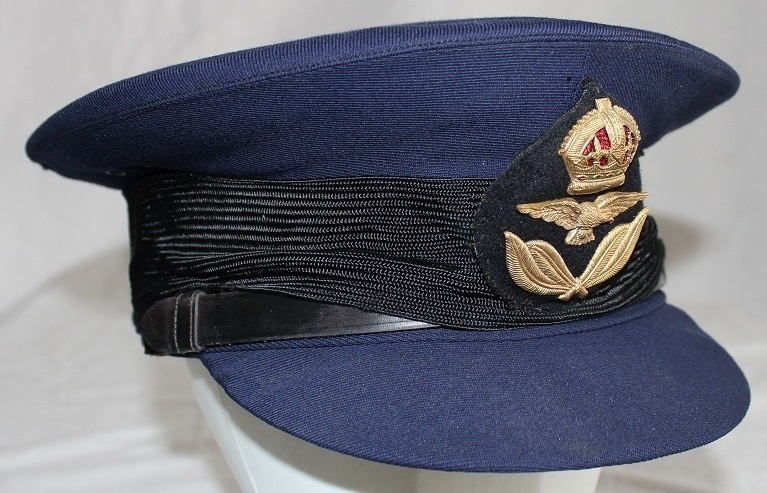 An unnamed officer’s service dress cap attributed to 257540 Dereck Jack French with an early type bullion cap badge. 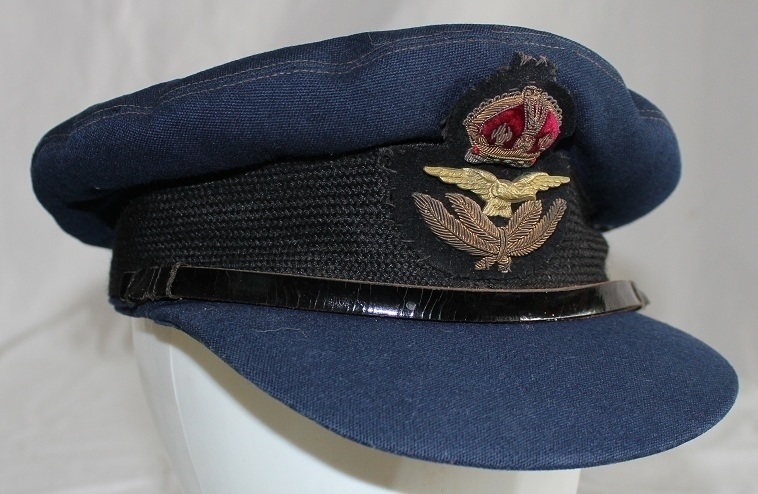 The cap is unlined but has a plastic diamond suspended by eyelets in the crown, the grey leather sweatband is unmarked and the cap has a blue cloth underside to the peak. 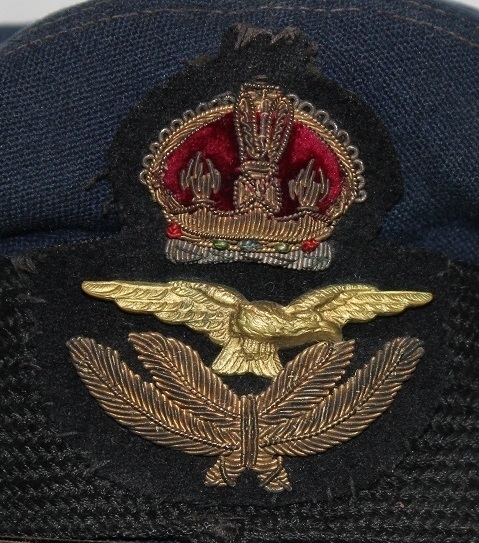 The chinstrap is held in place by 2 plastic RAAF buttons. H415. 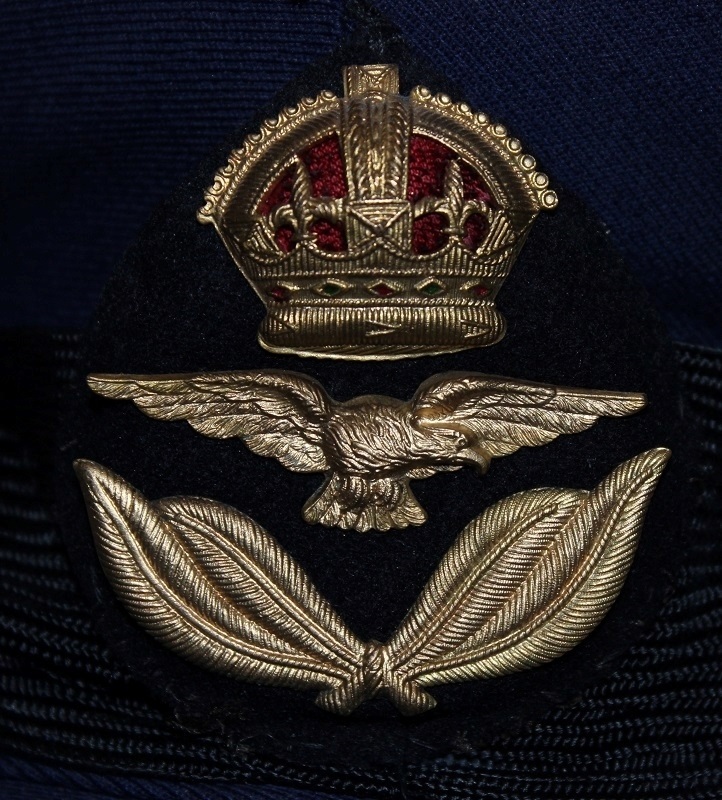 A bullion officers cap badge. H415. Blue cloth liner with suspended plastic insert. H415. 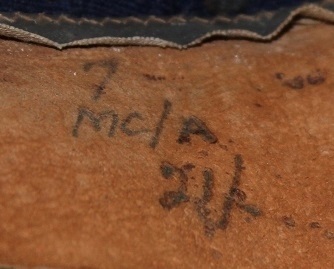 Markings inside of sweatband. H427. 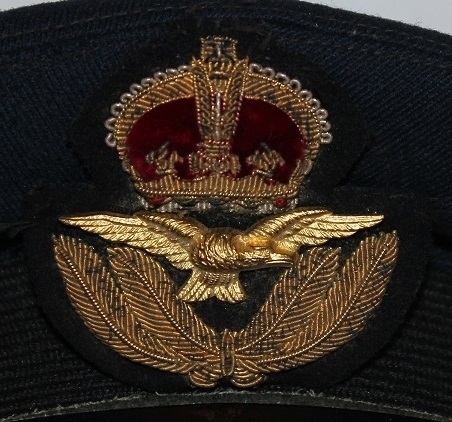 An unnamed officer’s service dress cap with a pressed gilt metal economy cap badge. The cap is lined with a black quilted material sewn in a diamond pattern and has a green underside to the peak. The brown leather sweatband is stamped MTX and the chinstrap is held in place by 2 plastic RAAF buttons. 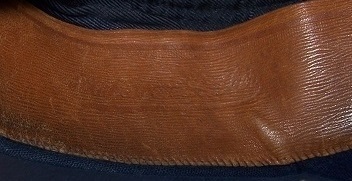 The cap is fitted with a khaki drill tropical cover. H427. A pressed gilt metal officers cap badge. H427. MTX stamp under sweatband. H429. 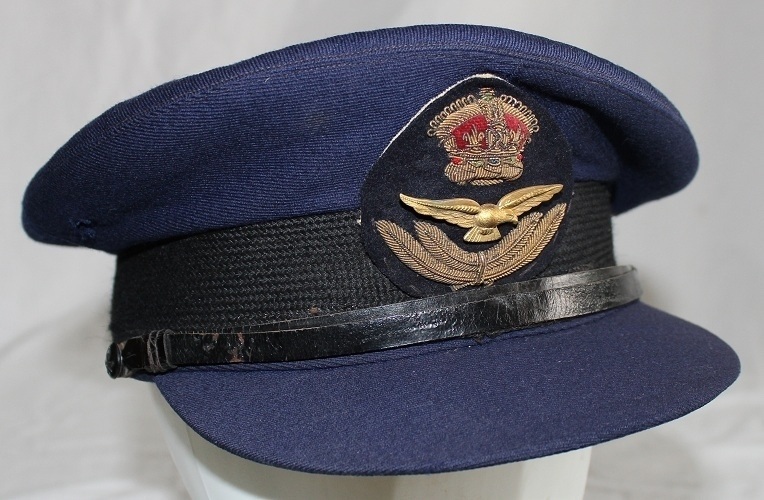 An unnamed officer’s service dress cap with a bullion cap badge. 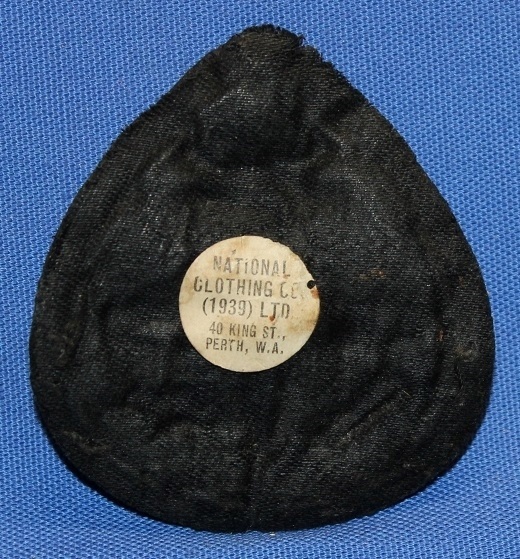 The cap is lined with a black quilted material sewn in a circular pattern and has a blue cloth to the underside of the peak. 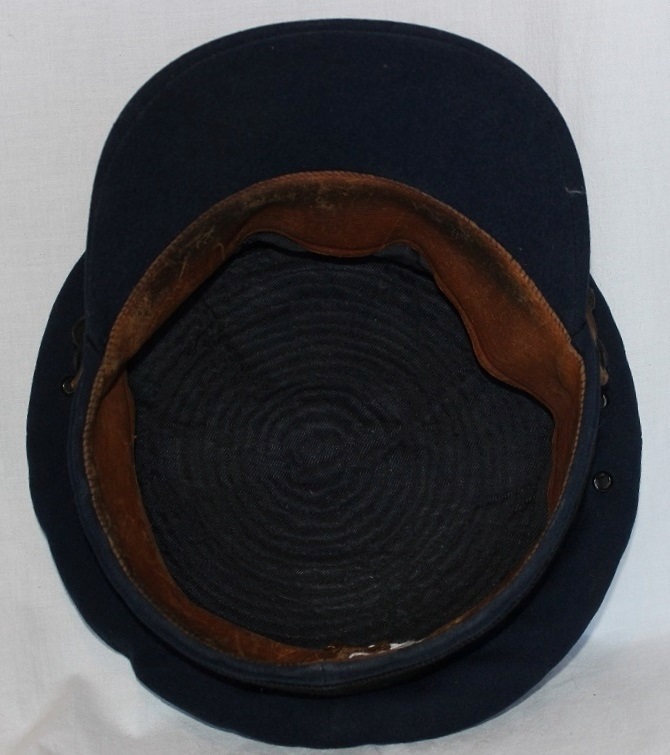 The leather sweatband is stamped Real Roan Leather and the chinstrap is held in place by 2 plain black buttons. H429. 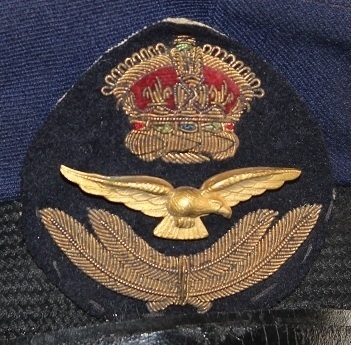 A bullion officers cap badge. H429. 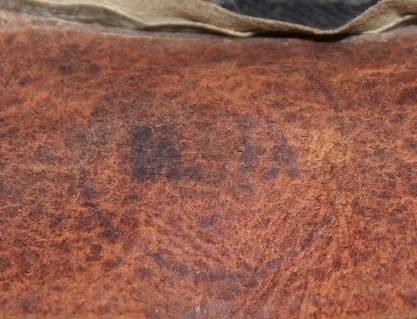 Real Roan Leather stamped into sweatband. H437. 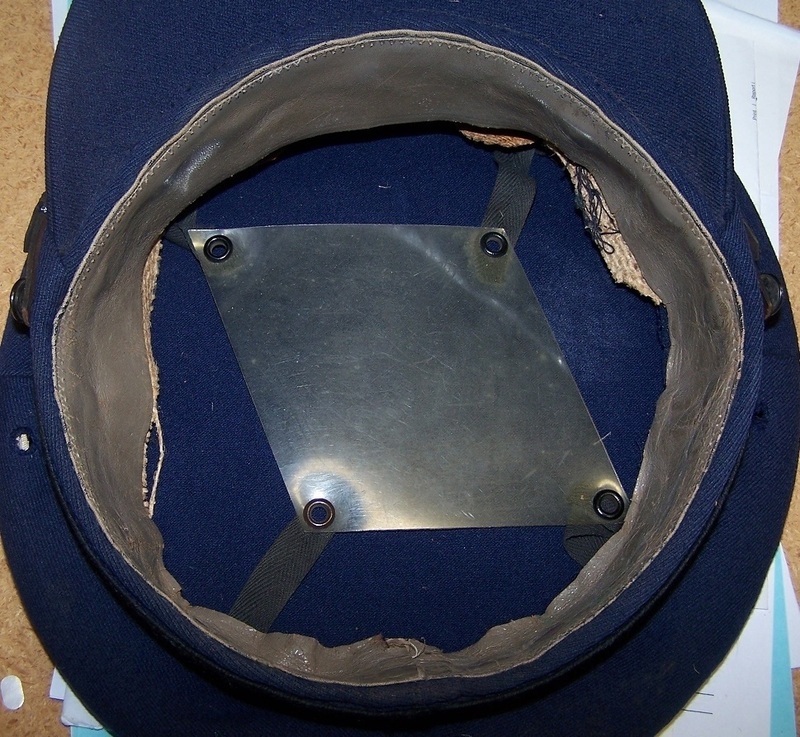 An unnamed officer’s service cap with a small bullion cap badge. 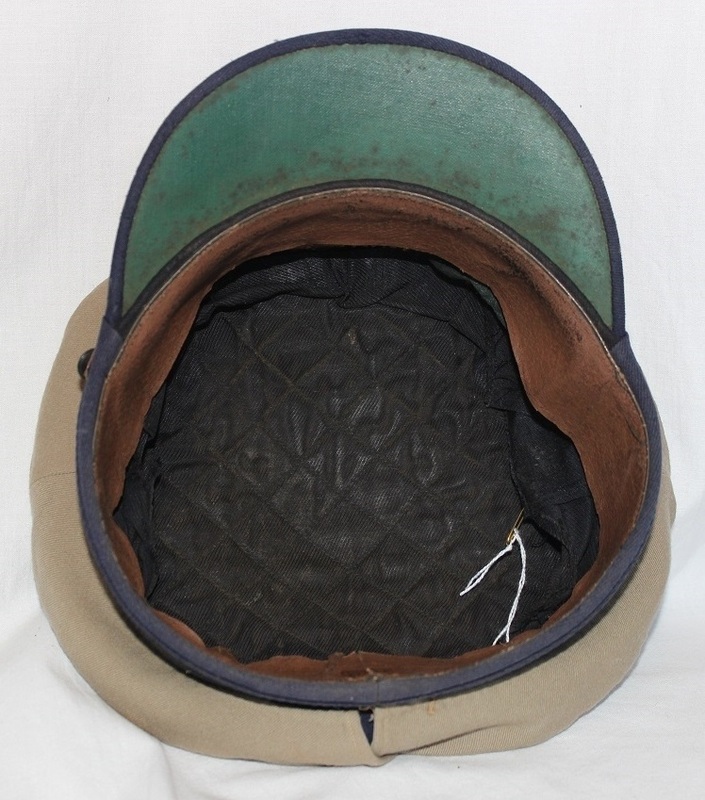 The cap is lined with a black quilted material sewn in a circular pattern and has a green underside to the peak. 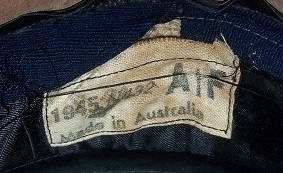 The leather sweatband is unmarked, but there is a white cloth label underneath 1945 N432 A arrow F and the chinstrap is held in place by 2 plastic RAAF buttons. H437. 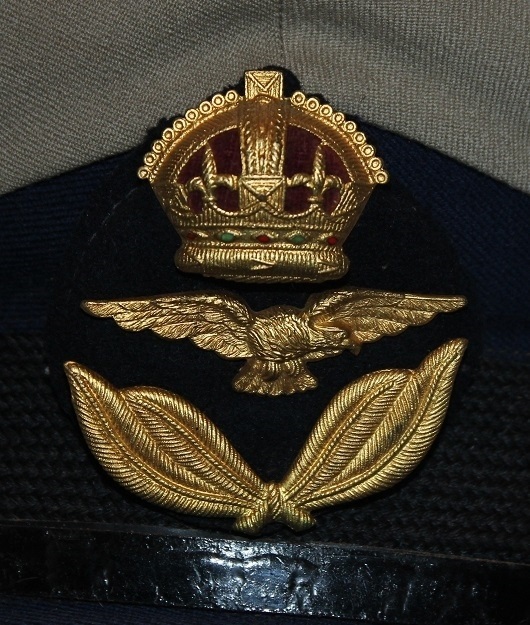 A bullion officers cap badge. H437. Makers label under sweatband.